To measure overall firmness of canned peaches in order to determine differences between different batches of product. A processor of canned fruits, including peaches, did not have an objective, consistent, repeatable way to measure the firmness of the canned peaches. By sensory tests only, they noticed that some batches of peaches were a lot softer or harder than others. Noticing the variability, the processer wanted an objective instrument that could give quantifiable data that is consistent and a test that is easy and repeatable. 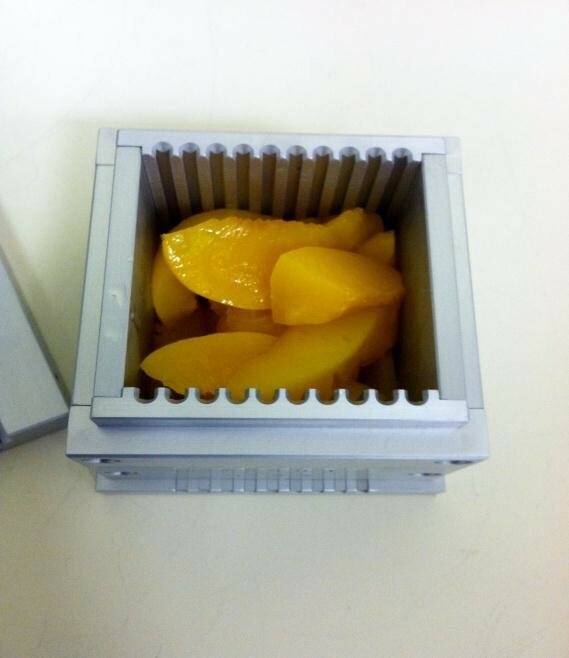 Peaches were drained and then put into test cell until test cell was full. That amount was then weighed out in grams. The samples ranged in weight from 181 grams-183 grams. Testing was performed with a TMS-Pro Texture Analyzer, a 2500N load cell and the CS-1 Kramer Shear Cell. The test program started at zero, then the blades ran down into the test cell, penetrating/shearing the peaches at a speed of 200mm/min and running until the blades penetrated out of the bottom of the test cell then returned back to zero. To the right, the graph shows the differences in firmness between Product A and Product B. The test method proved to be successful at detecting differences between the two batches of peaches. 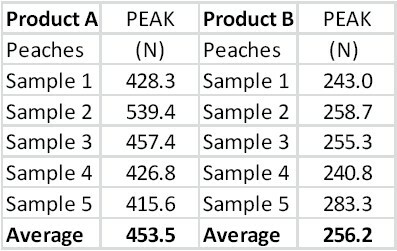 The processor can use this system and test method to compare batches against each other to make sure they are consistent in both quality and texture.